Can Tho (VNA) – The 8th Southern Traditional Cake Festival in the Mekong Delta city of Can Tho has attracted more than 600,000 visitors during five days, the organising board announced at the festival’s closing ceremony on April 16. The number showed a 20 percent increase from the previous edition last year, according to Nguyen Minh Tuan, deputy director of Can Tho’s Department of Culture, Sports and Tourism. He attributed the surge in visitors to the new activities this year which were designed to highlight the folk cuisine and boost trade and tourism promotion. The festival featured 220 booths introducing cakes made from 19 provinces and cities nationwide and Japan, the Republic of Korea, India, Italy, France, Malaysia, Singapore and Thailand. 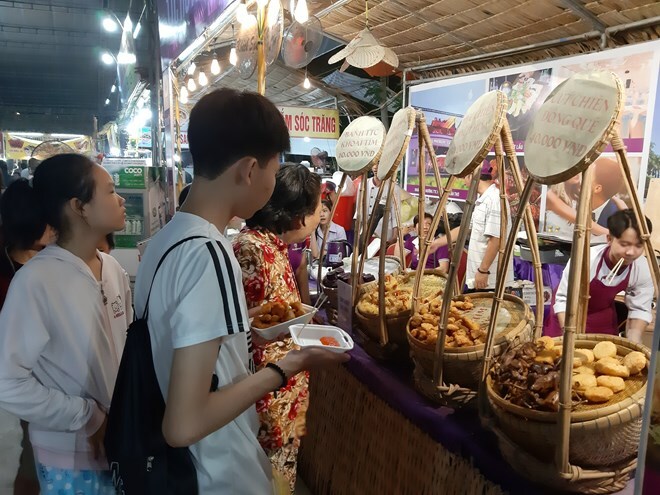 At the southern cuisine area, 150 types of original traditional cakes and their 400 variations of the Kinh, Hoa, Khmer, and Cham people living in the Mekong delta region were offered to visitors. Meanwhile, 84 artisans from 13 cities and provinces nationwide joined a competition on making southern traditional cakes on April 13, demonstrating their skills in making 70 types of traditional cakes.